The 3rd P Summit has already occurred and therefore the description of the program format is no longer being updated. The format of the 3-day Summit will ensure a high level of interactivity, multi-stakeholder partipation, creativity, and be outcomes-oriented. An extended keynote panel presentation and debate will precede parallel workshop sessions that will feed into the development of a Blueprint for global phosphorus security on the final day. Short presentations by accepted presenters will also take place throughout the Summit. 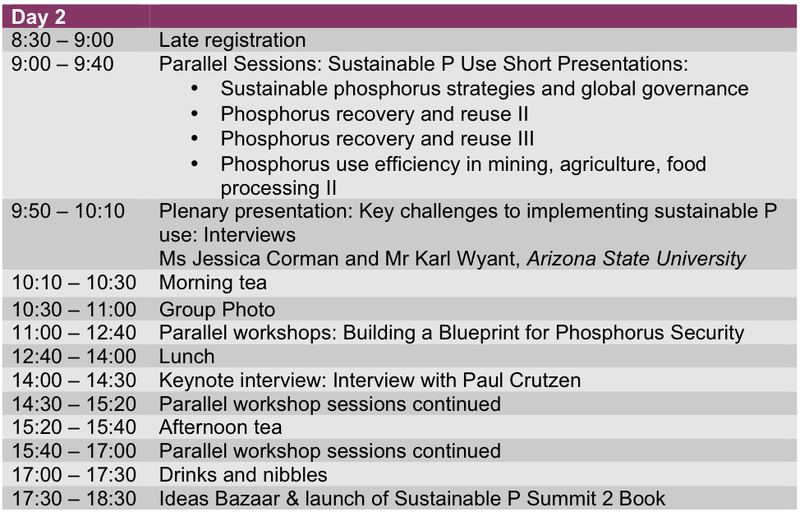 3rd Sustainable Phosphorus Summit hanbook now available - abstracts, sponsors, map all included. A high-level Expert Panel will set the scene for the Sustainable P Summit on Day 1 to highlight and trigger discussion on the key sustainability issues surrounding the global phosphorus challenge. The Expert Panel is comprised of six speakers with different expertise and perspectives from around the world. Each Panelist will provide a brief presentation relating the phosphorus challenge to their sector or field. Following the morning tea break there will be an extensive and stimulating discussion between the Panelists and the audience. Our Expert Panel represents the following sectors: phosphate mining, agriculture, nutrient management in agriculture, food security, the phosphorus recovery industry and low-cost sustainable sanitation. These span Australian, African, European and North American perspectives. phosphorus pollution and waste; or, sustainable phosphorus strategies and global governance. Each parallel session will be chaired yet highly dynamic and made up of fast-paced presentations. Speakers will have at least 3-4 minutes in their designated session speaking slot and their very own soapbox to stand on to promote their work. While there will be traditional digital presentation technologies available to all speakers, we hope to continue the dynamism of the Summit and rely on the zeal and passion of speakers to showcase their works in an energetic and engaging forum. Exchange of details and questions relating to soapboxes will occur during the Ideas Bazaar (17:30-18:30 Day 2) and organically throughout the Summit. The parallel workshops on Day 1 and 2 are at the core of the Summit. Summit workshops will serve as a platform for planning, thinking and debating phosphorus futures and what a possible Blueprint could look like. Stimulated by presentations and discussions during the Expert Panel and Soapbox sessions, on Day 1 these facilitated workshops will drive discussions on the long-term future for phosphorus from general and sector-specific perspectives and will also showcase and explore a new interactive global phosphorus scenario tool. Day 2 will address general and sector-specific challenges, initiatives and strategies towards sustainable phosphorus future, which will form the basis for developing the Blueprint for Global Phosphorus Security at the Day 3 plenary. All delegates have the opportunity to be an author of the Blueprint. A unique interview with Prof Paul Crutzen, winner of the 1995 Nobel Prize in Chemistry for his pivotal work on identifying Ozone Depletion. Prof Crutzen is now the Ambassador for the Global Phosphorus Research Initiative. In a one-on-one interview with Dr Dana Cordell, recorded on location at the Max Plank Institute for Chemistry in Mainz, Germany, Prof Crutzen shares his insights and perspectives with the delegates of the 3rd Sustainable Phosphorus Summit on responses to the Ozone challenge and the importance of the phosphorus challenge in the context of other contemporary global environmental challenges. He also reflects upon the significance of the relationship between policy, public awareness and scientific phosphorus research in the dynamics of a changing planet. 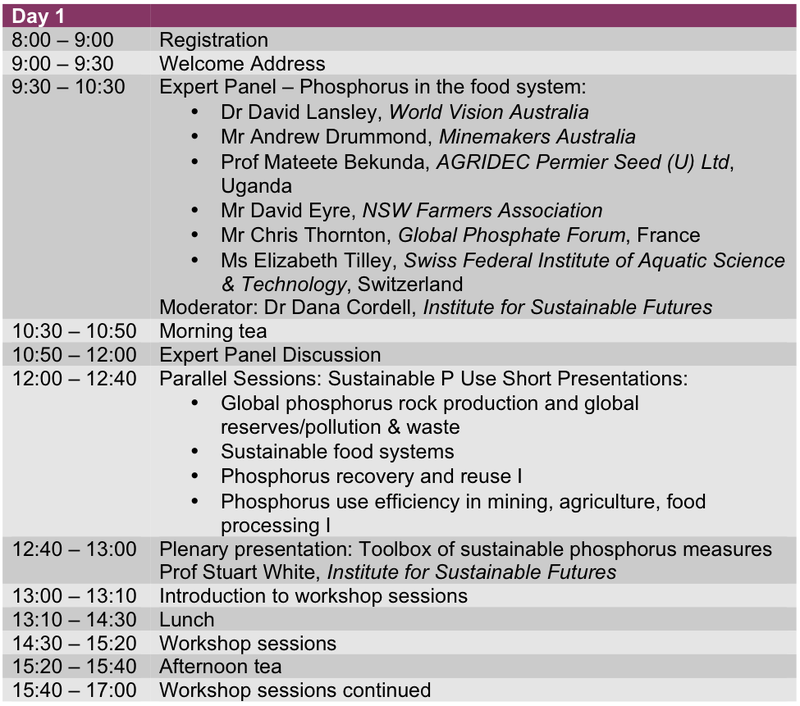 This plenary session will showcase a number of recent global and national sustainable phosphorus platforms and networks, including the Global Phosphorus Research Initiative, Global Phosphorus Network, Global TraPs, Sustainable P Initiative among others. Who are they? What are they doing? Where are they heading? Brief presentations showcasing each of these platforms will be followed by a plenary discussion, including how others can get involved, opportunities for cross-platform networks, and other related platforms. Following on from the Soapbox Sessions, the Ideas Bazaar is a creative space for delegates to connect with those ideas and speakers that captured their attention during the Soapbox presentations on Day 1 and 2. Hosted by comedian Dave Bloustien, the Ideas Bazaar will also feature the book launch of the outcomes of the 2nd Sustainable Phosphorus Summit held in Arizona in 2011, and will give delegates the opportunity to communicate their P Lightbulb moment – that moment that bought them to (P)hosphorus – through the (P)hotobooth and roaming Twitter platform. Drinks and nibbles will also be provided. This short yet powerful plenary session will commence with a Q&A on stage between the organisers of two national sustainable phosphorus platforms. The interview will cover the challenges and successes faced by setting up a multi-stakeholder sustainable P platform. The interview will be followed by delegates briefly reflecting on the key challenges they are facing in their sector/role/field in terms of implementing sustainable phosphorus use. The Blueprint for Global Phosphorus Security is a key Summit output and will outline steps to providing a more sustainable global phosphorus future. Designed and authored by delegates through the Day 2 workshop and Day 3 plenary, the Blueprint will outline the principles, challenges and opportunities for achieving global phosphorus security, identifying initiatives, strategies, roles and responsibilities for identified stakeholders. The plenary session on Day 3 will finalise the draft Blueprint and the final version will be presented to Summit delegates (following the Summit) for final comment in advance of its circulation through the Global Phosphorus Network, government, industry, academia and media networks. This document will set the tone for future research and policy action in the field of phosphorus sustainability and will bring attention to this emerging sustainability issue. Are you a postgrad student working on sustainable phosphorus issues? As the field of sustainable phosphorus grows, there are an increasing number of doctoral and masters students working on exciting sustainable phosphorus research projects. The Sustainable P Postgrad Network is in the process of forming, with a meeting being held in Sydney on Tuesday 28th February (the evening before the Summit!). We would like to invite any interested students to please contact James Cooper (JXC637@bham.ac.uk) for more information or to RSVP for this meeting. James is a doctoral student from the University of Birmingham who has volunteered to coordinate the Network. To wind-up the Summit in style, the banquet dinner will be a night of exploration and roving amongst the dinosaurs and fellow phosphorus enthusiasts. Using the setting from the now late-night Sydney institution Jurassic Lounge, the Summit Jurassic Safari Dinner will give Summit delegates the chance to experience a museum like never before - after hours and with drink in hand. The Australian Museum will be our host for the evening, and a menu designed by celebrity chef Sean Connolly will ensure that your tastebuds are fully satisfied. Price of the Jurassic Safari Dinner includes dinner and drinks throughout the evening in addition to entry into the Native Australia and Jurassic museum rooms.